An alleged official Argentine Navy UFO report. 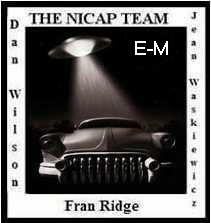 Combined visual and E-M incident involved the Navy transport A.R.A. "Punta Medanos." A large airship (never identified) was sighted from the stern of the vessel. The huge UFO was round-shaped, and it was moving at great speed. It displayed no lights and made no sound. As the unknown object appeared, the needles of the ship's magnetic compasses "suddenly and simultaneously" swung off course, pointing toward the UFO. At the time, the Navy report states, the UFO was 2,000 meters (well over a mile) away from the ship.